Beijing, Apr 22: Foreign Secretary Vijay Gokhale on Monday held talks with Chinese Foreign Minister Wang Yi here and reviewed the progress of bilateral ties post-Wuhan summit, emphasising that both countries should be sensitive to each other's concerns. Gokhale's visit for bilateral consultations is taking place amid renewed optimism that the vexed issue of listing of Pakistan-based Jaish-e-Muhammed (JeM) chief Masood Azhar as a global terrorist by UN, which has been stalled by China, is headed for a resolution in the coming weeks. Gokhale met Wang, who is also the State Councillor, a high-level post in the hierarchy of the ruling Communist Party of China (CPC), at the sprawling Zhongnanhai complex, the seat of power of China as it houses the offices and residences of the country's top leaders. 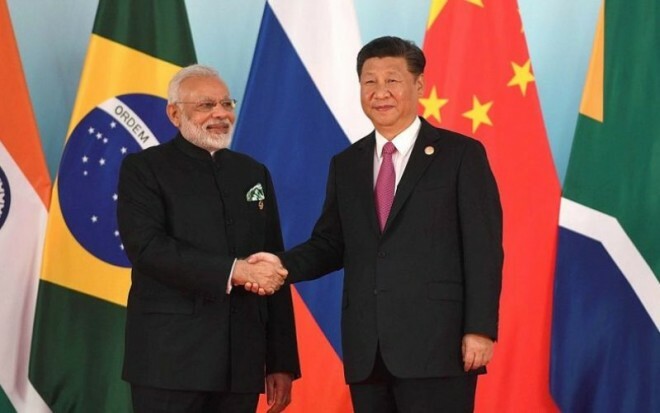 In his opening remarks, Gokhale said both sides were making efforts to implement the understandings reached at last year's informal summit at Wuhan between Prime Minister Narendra Modi and Chinese President Xi Jinping. "As your excellency said we will work together with the Chinese side to deepen understanding to strengthen trust to implement the decisions that are taken by the leaders and to do it in a manner in which we are sensitive to each other's concerns," he said. One of the issues that was expected to figure during this round of talks was China's continued attempts to block efforts to list JeM chief Azhar as global terrorist by the UN. China blocked Azhar's designation for the fourth-time recently stalling efforts by the US, the UK and France move at the 1267 UN counter-terrorism committee following the February Pulwama terrorist attack. It was the first technical hold put up by China post Wuhan summit. Also, India continues to have strong reservations to join China's mega Belt and Road Initiative (BRI) due to its objections over the China-Pakistan Economic Corridor (CPEC) as it is being laid through Pakistan-occupied Kashmir. Both the issues have become major irritants in the bilateral ties. In order to counter China's technical hold in the 1267 committee, the US, the UK and France have taken the Azhar issue to the UN Security Council (UNSC), which Beijing firmly opposed, saying that it should be resolved by the UN's 1267 Sanctions Committee. But, Beijing has also in recent days sounded more optimistic about the resolution of the Azhar issue, saying that the matter, which had cast a shadow on India-China bilateral ties in the last few years is headed for a settlement. Asked whether the Azhar issue, as well as that of the BRI, figured in today's talks, Chinese Foreign Ministry spokesman, Geng Shuang told a media briefing here that, "As to specific issues … the two sides have far more common interests than differences". "The two sides should accommodate each other's concerns and advance bilateral relations,” he said. “We hope the two sides will step up coordination and cooperation to sustain the sound momentum in bilateral relations. China is ready and would like to work together with India to this end," he said. Besides Wang, Gokhale also met with Vice Minister Kong Xuanyou and held talks with him on progress of relations on various front. On Monday, other Chinese officials will also meet with him, Geng said. He said during the talks, "the Chinese side expressed that India and China, as two important neighbours, and representatives of emerging markets and strategic partners should enhance strategic coordination and enhance mutual political trust, and maintain close coordination on international issues." "Both sides have far more common interests than issues, we should promote unity and coordination," Geng said. "Since the Wuhan Summit, the two sides have enjoyed good momentum in bilateral relations, we must sustain that. The Indian Foreign Secretary also said that after the summit, the two sides have had active political interactions and fruitful practical cooperation," he said. On April 19, Wang at a media interaction said that differences over the BRI would not come in the way of the development of India-China relations and China is preparing for a Wuhan-style summit meeting this year. He also said the CPEC is an economic project and has nothing to do with the sovereignty issues.